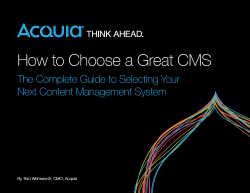 Download this white paper to learn if your current CMS supports your digital business strategy and what to consider when selecting a new CMS. The new realities of digital marketing include having hundreds of sites and campaigns to manage, control and edit which should be done without expert professionals. This can be achieved by adding functionality to your IT infrastructure that will increase your consumer engagement and longevity. Companies should find a Content Management System (CMS) that operates through a central dashboard that will track results and execute business strategy efficiently and be built to serve a global audience.